To introduce Alive CD Ripper, we are offering a $24.95 SPECIAL LIMITED TIME OFFER for this version! Click here to order now! Alive CD Ripper extracts audio CD tracks into MP3, WAV, WMA and OGG files. Alive CD Ripper is a powerful and easy to use cd ripper tool and extracts your audio CDs into MP3, WAV, WMA and OGG files on-the-fly. It can download the CD information from FreeDB, and save to local database. 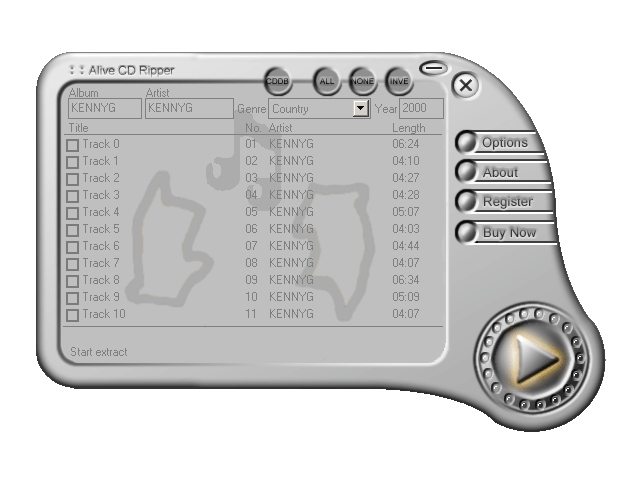 Alive CD Ripper also generates the Winamp Playlist file(M3Ufile), and let you edit ID3 tags in MP3 files. The MP3 and OGG Encoder of Alive CD Ripper supports CBR, VBR, and quality/speed balance. It also supports four channels mode including Stereo, Join Stereo, Mono, and Dual Channel. It has cool interface, this intuitive interface makes Alive CD Ripper the perfect tool for both new and experienced users. Alive CD Ripper fully supports schedule converting, and can be scheduled to convert files any time of the day or night, and can be set up to close program or shut down computer when done.